Located in the sought after community of Calabay Parc our home offers a peaceful setting close to all the attractions. Calabay Parc is ideally situated on US27 approximately five minutes north of Interstate 4 and five minutes south of US192. We are ONLY 15 min from the Disney Parks as well as only being a few minutes’ drive to local shops, supermarkets and restaurants. We are surrounded by some of Florida’s finest golf courses, including Champions Gate, Mystic Dunes, Falcon’s Fire, Ridgewood Lakes and many more. 15 min to Disney Parks 5 min to Golf courses 20 min to SeaWorld 25 min to Universal studios 30 min to Orlando International Airport 45 min to Sanford Orlando Airport. Our spacious two story home has over 2,800 sq ft of living space. Bedrooms - 2 Master en-suites, one Queen sized upstairs and one King sized downstairs. 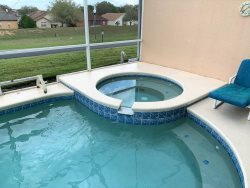 The downstairs master has a large walk-in wardrobe, double sinks and large bath as well as a separate shower cubicle, toilet and direct access to the pool deck. The upstairs master has a dressing area and bathroom with a large shower. There is a further King sized double, with bathroom, downstairs and 2 Disney themed twin rooms, which share a bathroom upstairs. This layout offers maximum flexibility and the space available means the house is suitable for either an extended family or 2 small families to share comfortably. With the addition of a sofa bed in the den downstairs, the villa provides sleeping for up to 12 people. All the bedrooms have TV’s or combined TV/DVD players Living space – a large open plan lounge, with flat screen TV and DVD player, I-POD dock stereo, with comfortable leather sofas. There is a dining area for 6 and views through the patios doors of the pool and open countryside beyond. The fully equipped kitchen off the living room has a large fridge/freezer, dishwasher, oven and all the appliances you’d find at home – microwave, kettle, toaster, coffee maker etc. There is a breakfast bar and raised breakfast nook, offering views of the pool, which can easily seat 8. A separate laundry room with washer, dryer, iron and ironing board is available. Games room – the double garage has been converted into a games room with a pool table, table tennis and a basketball hoop for hours of fun for all the family. Den – either an additional sleeping area with a double sofa bed or added living space with a TV/DVD and PS3 games console - great for kids. Upstairs landing – houses a seating area, which can be a place for quiet relaxation, somewhere to catch up on emails, read a book or for the kids to play. There is free WiFi throughout the property. Additionally we offer free local and national calls Outside – a large south facing L-shaped pool with a spa and 2 separate areas for sunbathing and eating – sun-loungers, table and chairs provided. We invite you to relax by our pool on the extended deck and soak up the sunshine, or take a break from the sun under the covered lanai. With no neighbors to the rear or one side you can enjoy privacy and the views over the conservation area and woods. A large screen makes this a bug free environment. Take a dip in the pool or sit and daydream in the spa – heating is available if required. For convenience there is a poolside WC and basin and an outside shower. Separate pool towels provided. There is a gas BBQ for alfresco dining. If you want a break from the theme parks then the Atlantic coast at Daytona Beach is only 1hr 20 mins drive or the glorious white sands and warm waters of the Gulf coast at Clearwater are 1hr 15 mins drive away. An information pack on all the local attractions is available. Our luxury vacation rental offers all the comforts of home and beyond, we are more than happy to answer any questions you may have and look forward to you booking your vacation with us.